The Futures Wheel is a way of organizing thinking and questioning about the future––a kind of structured brainstorming. It produces a graphical visualization of direct and indirect future consequences of a change or development. How to construct a Futures wheel? A group decides to brainstorm about a trend, idea, future event, or value. The subject is written in the middle of a piece of paper, a flip chart, black board, or on an overhead projector transparency. Next, the leader of the brainstorming session draws an oval around the item and asks the group to say what necessarily goes with this item. As impacts or consequences are offered by the group, the leader draws short wheel-like spokes out from the central oval and writes these impacts at the end of each spoke. 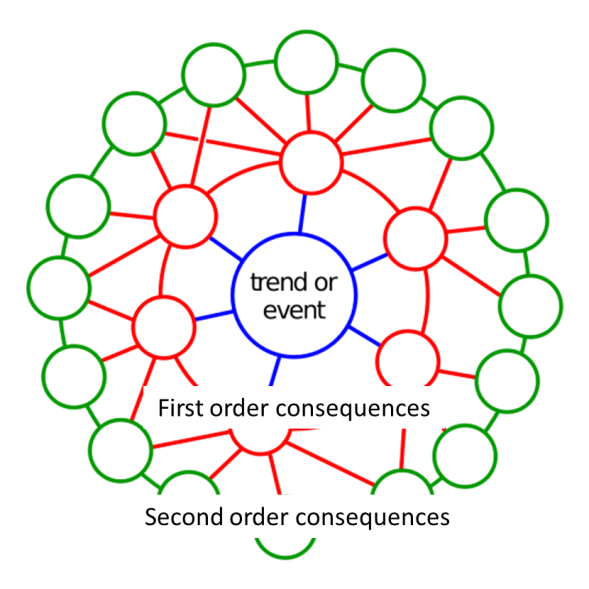 Next, the leader asks the group to forget about the original item in the middle of the Futures Wheel and to give the most likely impacts for each of the primary impacts of the first ring of primary consequences. As these secondary impacts are offered by the group, the leader draws two or three short spokes out from each of the ovals around the primary impacts to form a second ring and writes the name of these secondary impacts at the end of each spoke and draws ovals around them. At first, this process goes quickly, with participants listing second, third, and fourth order consequences with little or no evaluation. After the group feels its thinking is represented on the wheel, they can evaluate and edit the wheel to be more “realistic.” This step is similar to the clarification part in other brainstorming processes. When to use Futures wheel?